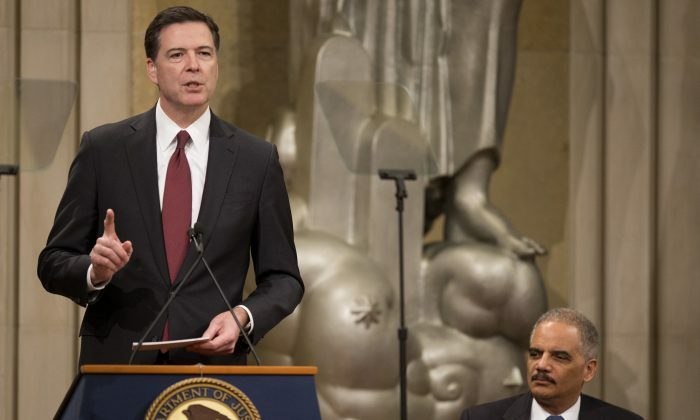 Comey urged law enforcement and citizens to face the “hard truths” about the disconnect in places not only like Ferguson, Mo., and New York City, but all over America. Comey emphasized that lethal encounters including Michael Brown and Eric Garner—both African-Americans, followed by protests nationwide and the assassination of NYPD Officers Wenjian Liu and Rafael Ramos, now have police and community relations at a crossroads. “We can choose to have an open and honest discussion about what our relationship is today—what it should be, what it could be, and what it needs to be—if we took more time to better understand each other,” Comey said. Comey’s call to understanding through discussion is complemented by his example of visiting FBI offices throughout the United States and having audiences with staff, law enforcement partners, community leaders, and citizens. It was my privilege to be a guest of the FBI Newark Division’s Nov. 14, 2014, audience with Comey. I was impressed with his candor, respectful listening, and exemplifying community policing by his personal rapport with attendees. During his Georgetown University address, Comey was truthful about the scandalous side of law enforcement including bias a century ago against Irish immigrants—from whom Comey descended—and the improper surveillance of Dr. Martin Luther King Jr. These types of injustices are a reason Comey requires all new FBI agents and analysts to visit Dr. King’s memorial in Washington, as well as the Holocaust Museum, to inspire diversity and respect for human rights. • Law enforcement overwhelmingly attracts people who want to help all people. • Cynicism can influence their decisions, and initiatives must take place for minority communities to be enhanced through role models, improved education, and employment opportunities. These are essential for avoiding a life of crime and imprisonment. • Law enforcement must work—in the words of NYPD Commissioner Bill Bratton—to really see each other. We must simply see the people we serve. • Citizens also need to see law enforcement as people and to appreciate the risks and dangers they encounter. The community needs to understand law enforcement challenges and give the respect needed so they can do their work. Throughout his address and most importantly by his actions, Comey personified community policing. Comey wisely delivered his address on Lincoln’s birthday, whom I believe is the pre-eminent catalyst for America’s police-race renewal. Through the prophetic words of Lincoln’s Gettysburg address proclaiming “a new nation, conceived in liberty, and dedicated to the proposition that all men are created equal,” America must rise to the occasion. America’s future demands honesty about all aspects of our law enforcement and race history. Yet, we live with confidence that our destiny of reawakening the nation—inspired by the example of Abraham Lincoln—will be ignited by moral courage, persevering integrity, and transformational leadership.